Juan Carlos Garrido was without Borja Valero, and he surprisingly chose to leave both Cani and Javier Camuñas on the bench, instead using Jonathan de Guzman behind the front two. Jupp Heynckes went for Bayern’s usual 4-2-3-1. He introduced Daniel van Buyten to the backline, but the Belgian had to go off injured midway through the first half – so Rafinha came on, Jerome Boateng went into the centre, and Bayern returned to the back four that played in the 7-0 win over Freiburg. Anatoliy Tymoschuk came in for Luiz Gustavo in the centre of midfield. Villarreal’s start to the season has been dodgy, but even Bayern must have been surprised at how easy their task was. The away side had a host of chances, mainly falling to Toni Kroos and Nils Petersen (who came on for Mario Gomez). Villarreal had unusually little possession and created few chances. 4-3-1-2 against 4-2-3-1, then, except the 4-3-1-2 didn’t manage to dominate possession, the clear area of advantage in this match-up (by virtue of the numbers game in the centre of midfield). How did Bayern keep the ball so well? First, their full-backs were often free, and second, Bastian Schweinsteiger and Tymoschuk worked hard to make themselves available in the middle of the pitch. Villarreal did try and close the full-backs down by moving Giuseppe Rossi and Nilmar wide onto them, but Bayern were still able to retain possession because Villarreal sat deep, didn’t press, and usually the holding midfielders and centre-backs were in space. Rossi and Nilmar moving wide did stop the Bayern full-backs moving forward, however, so Villarreal weren’t as prone to the 2 v 1s down the flank as Roma when they went 4-3-1-2 against Bayern last year. One must question Garrido’s choice of formation. First, it offered the full-backs no protection from Bayern’s wingers. If Garrido had done his homework, he would have known that Bayern work their left-hand side a lot this season (in the Bundesliga so far, 42% of their passes are played down that side, compared to 29% each through the centre and down the right), and Mario Gaspar was always likely to be facing a tough task against Franck Ribery. Maybe that’s why he chose to play Carlos Marchena to the right, but he wasn’t mobile enough to get out and help Mario. Ribery was excellent, and created a goal for Kroos within the first ten minutes after skipping past Mario and cutting the ball back. The bigger problem was that Villarreal had no link to the front two. De Guzman was making his first start for Villarreal – it seems strange to introduce him in such an important game, especially with Cani sitting on the bench. It seemed obvious from a very early stage that Villarreal were going to struggle to create chances, and whilst it would have been an absurdly early change, it wouldn’t have been unreasonable for Garrido to bring on Cani as soon as Villarreal went behind. Three holding midfielders wasn’t the order of the day when 1-0 down. Villarreal even resorted to launching balls forward for Rossi and Nilmar to challenge for in the air, a ludicrous approach, although Rossi had one good chance when he got in behind van Buyten with his pace. Bayern were probably helped by van Buyten’s injury, as Boateng is much quicker and more able to deal with Rossi’s sprints. Cani replaced Marcos Senna at half time but Villarreal’s shape barely seemed to change – it took until the 72nd minute for Camuñas to replace De Guzman and Villarreal to go to their 4-4-2 / 4-2-2-2. By that stage, Nilmar had been replaced by Marco Ruben, a sign that Villarreal were going more direct anyway. It all seemed confused, and Villarreal never looked like getting back into the game. Bayern actually enjoyed more possession in the second half, and their display was a great example of how to hold onto the lead – they didn’t sit back, instead they held onto the ball, used it intelligently, and eventually broke and got a second, through Rafinha. Heynckes didn’t have to alter anything, though – it was a routine win. A disappointingly tame match. Garrido’s formation didn’t suit his side – it left his full-backs vulnerable, made his side’s passing too predictable, and asked far too much of the debutant the side was built around. Rossi and Nilmar combined well when they got the ball, but that was very rare. Bayern kept the ball well and created lots of chances. In terms of specific tactics, the fact that the full-backs rarely went forward meant Rossi and Nilmar weren’t able to find space on the flanks, and the major battles took place elsewhere. Then, please, could you mention one match from tonight, that would be more relevant. Villareal is a team worth our focus. Personally, I’m puzzled why would Garrido play this narrow formation in a home Champions League game against die-hard 4-2-3-1.
i agree benfica vs united would also be interesting; city vs napoli as well. Bayern is a far more interesting game to cover. It’s not about one of the teams, it’s about one team facing the other, one system facing the other, tactical battle of two coaches. It’s not “awful”, I watch the matches I want to watch because I think they’ll be interesting. Sometimes I get it wrong, oh no! Nothing more annoying than watching a game, making loads of notes, spending an hour writing it up, halfway through watching second game of the night, check comments and there’s some plonker complaining about the game selection. Jose Carlos Garrido favourite for first sacking of the new season? The guy above me has stolen my nickname! ZM can surely see different emails. Please, ZM, do something! Idiots like you should just piss off. ZM, could you please update “Upcoming” section? Firstly, appreciate the write-up Michael. Villarreal: I know it’s only early but I do have a level of concern for them at this point. The performance this evening was extremely flat and was something akin to their displays towards the end of last season (and even with Valverde in charge prior!) when fatigue had set in. The decision to play with the three flat midfield players was a strange one, and on the contrary to what Garrido has done in recent years. As good as the link-up between Nilmar and Rossi is/was, they need a breaker from midfield to revolve around them both. It takes players away but also creates more gaps for them to run into be it with back to goal or in the channels. Cani starting would’ve made more sense as he can be this player – being at home they could’ve even played both Cani and JDG with Bruno and Marchena/Senna holding. Bayern were not even playing at a particularly high tempo, but instead operated in a composed manner with the odd, incisive bursts from Ribéry and via the full-backs. Because Garrido wasn’t prepared as you rightly mention, they penetrated more. Cheers David, agree with most of that. I don’t really get why he moved away from the 4-4-2ish shape, even if he’d wanted to play a defensive midfielder tucked in on the right, fine. But I’m sure Cani would have got more space on the left than JDG did as a 10. Hello ZM, thanks from me aswell for the match report. I watched that game yesterday, too, and I can understand the ‘complaints’ in some of the comments above, since it was kind of relatively slow and uneventful. My interpretation in Garrido’s move away from 4-2-2-2 towards the narrow 4-3-1-2 is that he ‘knew’ how Heynckes is installing his 4-2-3-1 at Bayern. Heynckes is relatively fanatic about defense and control, and at Bayern tells his fullbacks not to advance and overlap too much, rather to stay back. In that sense, I guess, Garrido presumed there would not be too much danger from them, so he could afford his narrow and centrally dense 4-3-1-2. I guess that worked in principle (Bayern had trouble in midfield), except for the fact that the Bayern players were more fit, and at some point Rafinha couldn’t stand it any longer and broke Heynckes’ rule to motor past the half-line. Lahm constantly got forward and tried his trademark charges into the box, so I wouldn’t say that the fullbacks weren’t attack-minded enough. Instead, like you said, they were simply fit enough to track back quickly. “I can understand the ‘complaints’ in some of the comments above, since it was kind of relatively slow and uneventful.” – I take your point, but how am I supposed to know that?! Surely the complainer can understand I can’t wait until all eight games are done, try and work out which was most attractive, then write on that? I simply don’t have time. Interesting thoughts, you might be right about the full-backs. However, even then I think as soon as they went 0-1 down, it was time for change. My remark on ‘understanding the complaints’ was in no way meant to criticise you or your match selection. It is ok to be disappointed by a match in retrospective, but of course rather childish to complain about a selection that was made beforehand. 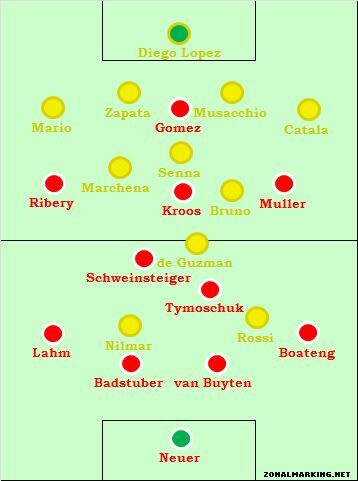 In fact, I think it was a very promising match-up, and for example I was initially excited about the potential 4-2-2-2 vs 4-2-3-1, and maybe whether Bayern would also go for a 3-man defence instead, as Barca recently did. (Imo, Bayern could have gone Badstuber-vBuyten-Boateng as centrals, plus Lahm and Rafinha as wingbacks). In fact, the game turned out not to be that spectacular in the end, because for Bayern it was more about control/dominance/lock-down, rather then going for a high goal count. Agreed, Villareal should have tried something else earlier. Rossi and Nilmar must have been frustrated with the lack of service today. In ZM’s defence (not that he needs to be defended): Surely it’s nice (at least for someone within the UK) to see some in-depth coverage that extends beyond the EPL ‘big 4′. In any case, this is a tactics blog, so surely ZM should be commended for having chosen to cover two games which – whether they were poor or not – were ultimately influenced to a significant extent by tactical decisions? Spot on. As much as I think Villarreal are going to struggle this season, today’s performance was very poor – players looked even soulless. Garrido’s line-up certainly raised some eyebrows, but also his lack of reaction in time. Anyway, as I said, I think Villarreal will struggle to get a Europa League spot in La Liga and will finish bottom of this group. They had a short squad last season and they have replaced Cazorla with… Camuñas. Of course they’ve also brought De Guzmán, who should do a good job, but still. Not enough depth, not enough quality to step up… at all. Bayern, first game defeat aside, have been outstanding this season. They seemed to help Villarreal with the inclusion of both Van Buyten and Tymoshchuk instead of the faster Brazilians, but they always looked on top. Then Rafinha came in earlier and it was even easier to get past their wings. By the way, I also had to make a decision regarding which game to watch and I picked this one. I also wanted to watch Man City v Napoli, but you can only pick one, don’t you? What I don’t get is how people can come here to constantly complain. Maybe just a hater or a troll, or someone too young. Cheers. I thought Tymoshchuk did Ok, though? Good positioning when in possession, always made himself available. Yes, of course! I didn’t mean he did bad – he was good as you say. I meant that the first thing many thought after seeing the lineups was that they could be exposed by Villarreal’s fast attack, but then nothing close to that happened. Wow, that is confusing to me, because Tymoshchuck had always been solely interesting do to his crazy positioning and vision. The Sueddeutsche Zeitung once called his style chess with tackles, and he played a lot of last season as a full-back, despite having the pace and experience to do so, hinging just on positioning and challenges alone. He is of an advanced age(having coming to Bayern solely on the old transfer policy of buying everyone that annoyed Uli Hoeness in direct games against Bayern – see Gomez, Gustavo, Rafinha and Olic) and as such lacks pace. Gustavo is quite the opposite – rough and speedy, with a focus on sprint battles but sometimes bad positioning. Both have quite a good distance shot though. I can understand why Gustavo didn’t start, he is neither calm(which can be a disadvantage) nor experienced, and picked up bookings by the busload with Hoffenheim. Pair that up with the sometimes bungling Van Buyten and Bastuber, and the very two-faced Kroos in front. Have to say that I agree with Trunken on Tymoshuk. Don’t get me wrong, he is not a bad player, but neither a very good one, imo. I always get nervous when he has/gets the ball somewhere in DM, always looks like he might miscontrol it or play a poor pass that will be intercepted and lead to a chance for the other team. zonal marking, why do think garrido is going so far away from 4-2-2-2? Lack of Cazorla? He was perfect for that system. I’m not a huge fan of Cani (although he would have been better tonight than JDG) and yet to see that much of Camunas, but haven’t seen anything to make me think he’ll be a good player at this level. However for the sake of Villarreal’s passing game, and for the Rossi/Nilmar combo, to me it makes sense to carry on with the 4-2-2-2. Maybe Garrido just doesn’t think he has the (middle) ‘2′. Thx for reviewing this game, ZM. I, for one, was interested in it. It’s been a while since i last bothered with the comments on this great site. Wtf happened? An invasion of 12 year olds? Anyway, thx for your effort. Btw, I find it helpful to read some of these comments (such as Yossarians, for instance) in suitable accents. You appreciate I was attempting a parody though, I hope! ZM dont listen to that clueless guy. I read a lotta articles here of games I didn’t watch..your analysis & intergration is very sound. Although my one criticism would be that the focus is too much on territorial analysis at times in your pieces. Countless times I’ve read about the fullback levers. A shift in emphasis perhaps could be provided to specific team styles and decision making of coaches. For example I found v Boas’s ideosyncracy truly bizarre last night, where he chose to play four attacking left footed players. They were all located to the left hand side and made Chelsea’s approach very rigid. However the fact I noticed this was down to this site. Hover the fact I noticed this is down to this site. Really disappointed that Cani didn’t start this game. His display in Villarreal’s Champions League qualifier second leg (a game that I believe was covered here) was marvelous, and I really can’t understand why Garrido waited until half time to introduce him. As for Camunas, I really can’t complain about his exclusion – he’s been wholly underwhelming since arriving from Osasuna. You are damn good at doing these write-ups an hour after the match! I would need to 1) obviously know more about tactics, 2) review the tape after the match. I feel you must be intuiting players’ movements outside the TV camera box, since it’s hard for me to get some of the tactical insights from TV. As someone who doesn’t know much about the Spanish teams except the big 2 I will say that you encourage me to learn more. Keep it up! I appreciate you are not the DJ that just spins top 40 all night. I often have problems drawing proper tactical conclusions from the shots TV cameras are providing. For what it’s worth, I get my high school team to watch games and read ZM’s summaries. It’s the best, and most interesting, way for them to learn tactics. I wish my team would read this. I play centre mid and was trying to explain to my 2 centre backs the idea of splitting and letting me drop deep to form a 3. Needless to say i got 2 blank looks. In this excellent analysis, ZM asks why a 4-3-1-2 doesn’t keep possession against a 4-2-3-1. He assumes they should due to a numerical advantage in midfield. This is puzzling to me, because I see Bayern with 5 in midfield (2 holding mids + 1 attacking mid + 2 wingers) and Villareal with only 4 (3 holding mids + 1 attacking mid). Doesn’t Bayern hold the numerical advantage in midfield? Additionally, Villareal is set up very defensively. They’re only outlet is De Guzman or long balls to the forwards (as ZM pointed out). ZM very rightly pointed out this tactical error by Garrido. You generally take the central midfield (there’s some quotes from Mourinho about why 4-3-3 beats 4-4-2 because 3 beats 2 in the middle). So really it’s Villarreal 4 v 3 in the middle, or 3.5 v 2.5 if you take the attacking midfielders as ‘half’ midfield, ‘half’ forward. Thought that was his fave position? Nope, he repeatedly stated the center to be his favorite position(where he broke into the starting team), although he did his best games on the right. Müller plays on the right for the National Team and filled in for the injured Robben against Villarreal. He’s not as effective out there as he is behind the striker for Bayern but he still does a fantastic job. He’s the kind of player whose positions is really not important, he’ll always deliver and be dangerous. Now, when it comes to function or positioning, it’s just the way Bayern play. They are very traditional in the way they use their wide players and that is really their primary mode of operation. For the NT Müller tends to play as the right forward in a 4-2-3-1, not as a true winger like Robben. Certainly not standing on the paint for the whole game. I don’t understand the point of having him so wide because he doesn’t beat players the way Robben does. I also prefer him there than central. I thought Kroos looked very very good at AM. He plays there because he can play every offense position pretty good. And both at Bayern and for Germany there are others who play the central part and who are much weaker than him if positioned on the flanks. So it is up to him. But he stated in the past that the false 9 (or the 10 if you want to) behind the striker is his favourite spot. And I think so too because his unorthodox moves and way of playing is a real danger in the box. Good player anyway. Of course he´s not Robben, but he does as well as the dutchman on the right. He is always a goalthreat and he is qucick and skilled, eventhough it doesn´t look like this because he is quite tall. The strenght of being a teamplayer, a player with great vision and the will to defend, is the big difference between him and Robben. And these atributes are requested in a 4-2-3-1. Plus he can link up with the other 3 attacking forces and his fullback because he fits in every (attacking) position. All that is making Munich less predictable, than with Robbens one-dimensionel “cut in and get a goal”. Heynckes will have to let Robben return because of the quality he provides when he´s fit, but I´m not so sure if this will help the team to play better. Btw: ZM could have focussed on the munich part of the game too. I agree with ZM choice of games, they have all seemed to be the more interesting games, arsneal vs BD was really about similar styles, Chelsea game was about them braking down the german side, man city were allways going to play a counter attacking side, i have preferred learning about the side we dont hear about a lot. The only game missed out is maybe man u vs benefica, where i was surprised to see benfica outplay them, and would have liked to see why that was, because from games reviewed on this site last season, they were quite the poor side. Villarreal – Very poor from villarreal, who were a side i actually very liked. There fullbacks were pinned back, and this is a clear problem as they lacked width, and needed the fullbacks to get forward, but this seemed more part of a overall defensive plan, which doesnt suit the villarreal players. I think they could have just used senna and marchena in deep midfield, and let marchena press kroos on the ball, and have senna stay deep and mark the space in front of the penalty area. Then instead of bruno (wasted player in this match) they could have fielded a player further forward. I think the answer could have to play ruben as a central stiker then let rossi and nilmar play off him and look to run in behind, and also be able to mark the fullbacks without giving up the CBs. I think then guzman could have got more into the game, who i think is getting very harsh critism as he wasnt really helped in this match, and with more attacking players around him, could have had a better game. Bayern – Actually seeing how poor villarreal were, bayern could have played much better, they seemed to be playing with the handbrake on, though given they won and have a game at the weekend, maybe it was best not too use up too much energy when the win can be achieved anyway (sign of champions in my books). The team was much better with boateng at CB and rafinha on at RB, have the side more balance, with boateng more comfortable dealing with pace, and rafinha providing attacking threat from RB. Otherwise i think the team was set up prefectly, Schweinsteiger was fantastic at finding space, keeping possession and starting up attacks (such a intellgent player) and Tymo also found space well, and kept possession, though left the creative responsibility to Schweinsteiger. Tymo also dealt with guzmen well, whenever he got the ball he was pressed by tymo, kept guzmen quiet. Kroos, depsite being surrounded by three CM’s had a big influence on the game, and did really well to get into great scoring positions. Ribery and muller had great games, dominating there fullbacks (especially ribery) and Gomez (before coming off) played well i thought, and occupied both the CB’s and was threat whenever the ball was wide. Overall, i thought Bayern won more because of how poor villarreal were, as they used three defensive midfielders, yet didnt really stop bayern playing (with kross having a big impact on the game). I think you are right. But consider even with the handbrake on they easily could have won 0-4 if they wouldn’t have wasted the chances like they did. For all the praise Bayern seems to take one must bear in mind that they only created 4 shots on goal in the first half (just as Villareal managed to) and at the end of the day enjoyed just about 54% possession. During the first half they never really looked like scoring. I was disappointed by the quality of their offensive performance. Gomez was caught offside 5 times in otherwise promising positions! The partnerships down the flanks didn’t seem to reveal any synergy. Müller & Ribéry often ran down the flanks into space their fullbacks wanted to move into. It was like all four had been told to stay wide and hug the touchline. Müller especially spent most of his time in harmless positions and nowhere around the penalty area in which he likes to sneak or combine into. I’m also under the impression that Schweinsteiger, Müller & Kroos could use some van Gaal to maintain the high quality in passing ability. Bayern didn’t really do much to win back the ball. In fact they kept their 2-4-3-1ish shape and waited for interceptions or mistakes that eventually came. Both teams surprisingly didn’t seem to be very comfortable in possession. Bayern scored an early goal, didn’t really go for a second but scored anyway after Villareal altered its strategy in half two. Without being 0:1 up victory wouldn’t have been assured at all. There is nothing that indicates that Bayern could live up to their dream of playing the final in the Allianz Arena. Anyway thanks for covering some German teams! Yes – I am sure Mueller is told to stay wide. If you see Schweinsteigers heatmap of yesterday’s game you see that he has a prefered spot on the right line where he moves whenever Mueller moves to the middle. They still are experimenting with the positions and the defense is the main issue as that was the problem last year. Even with offense in second gear they should score and that is enough when the defense holds. They scored 50 goals in the second half of last season – but caught a lot of stupid ones. Mueller is best in the middle at Bayern especially in combination with Gomez – and him and Robbery change positions a lot. He did more assists for him than Robben and Ribery did and even if he has a scoring problem right now he has done some assists already this season (usually then when it is important and not the unimportant ones) and got Bayern five penalties in their games until now (another won for the national squad). No dive in it – maybe he uses a special perfume so everybody wants to lay him as soon he gets into the penalty box. Bayern’s problem is that whereas he can play every position in the offense and performs that pretty decent (as e.g. in the World Cup) there is no other backup for Robben for the right. Alaba, Pranjic and Kroos can play left when Ribery is out. Actually Alaba has played right before(Most Manager Games started showing him as a right defender before moving him to midfield), same as Pranjic who covered right back against Hoffenheim last season and was a right winger at some point. Usami has been played on the right on his debut, although he was substituted again after 10 minutes. I am a Sri Lankan fan of football and surely find this site the best tactical site on it. When I first visited this site, I only knew that defenders defend and attackers attack. Maybe because of the video gaming experience, but since I have been following Mr.Cox, I learned lot more. Keep it up. *Never pay too much attention to those “complainers”. You are not omnipresent, you can’t be everywhere. PS: Just curious, do you follow the matches in TV. It’s bloody difficult to break down the numbers and the formations there. If you follow them in a site, please tell a site which we can watch the less profiled matches. Valero was surley missed (Suspension) for Villarreal. Cani never steps up in real big games. DeGuz was the reason for the 4312. Yeah, took me 20 minutes to write a comment, just to visit your page again, check for responses and to see that it has been already deleted. Is there a reason for that? Excellently written article, UGG Boots if only all bloggers offered the same content as you, the internet would be a much better place. UGG SalePlease keep it up! Cheers. Going to report on Schalke 0:2 Bayern, 4-3-2-1 vs 4-2-3-1? Cheers! Afraid not, too many other games for me today!